Part of our advanced patient care includes detecting and preventing a large variety of oral diseases which can be potentially life-threatening or cause permanent damage. The compact yet powerful VELscope Vx is the most innovative tool available for assisting in the discovery of oral abnormalities, including soft tissue abnormalities, oral cancer and pre-cancer, as well as bacterial, viral and fungal infections. How does VELscope Vx work? This important exam for discovering any possible oral tissue problems is non-invasive and requires no unpleasant stains or rinses in your mouth. 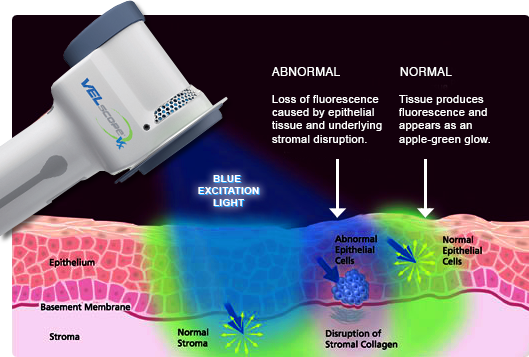 An Artistic Smiles professional simply uses the specialized VELscope Vx instrument to shine a blue-spectrum light into the mouth, thereby showing recognizable patterns within the tissues. The safe blue light enhances the contrast between healthy and unhealthy areas that have been disturbed due to disease or trauma. Sure, we love to help our patients have beautiful smiles. Just as important, though, is the early detection of oral diseases that could impact your entire life. Part of our philosophy is to utilize the latest technology available for our patients’ best oral health. We look forward to helping you attain yours too. A smile is worth a thousand words. I thank Dr. Lamberton for my new smile. Dr. Lamberton is an excellent dentist and cosmetic dentist. He is very professional, highly skilled and caring. A true artist. His office is beautiful and so relaxing. His staff is amazing. Nicole, Jo, Krista and Karla are exceptional as well. I am always greeted and welcomed, put at ease, and treated with TLC. Dr. Lamberton and his staff are the best! Any patient who is treated by Dr. Lamberton will love their smile.